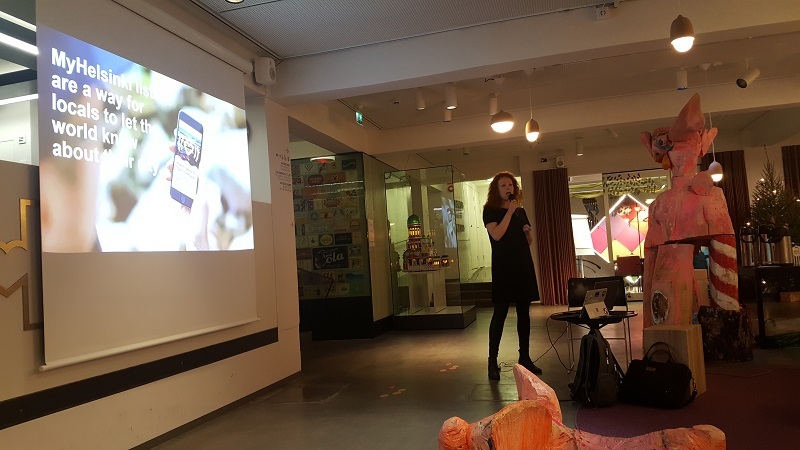 The data opened by Helsinki Marketing and the pilot project with Tencent were among the topics explored at the Helsinki Loves Developers meeting in December. Helsinki’s city marketing is strongly based on local recommendations and flexible digital solutions. 2018 was a year of development, especially on the digital front, thanks to MyHelsinki Open API , released in late 2018, and the Tencent collaboration that resulted in the WeChat MyHelsinki mini program. Jenny Taipale presents MyHelsinki at the Helsinki Loves Developers meeting arranged in the lobby of the Helsinki City Museum. Photo: Tanja Lahti. Helsinki Marketing maintains three different databases, the data of which has been used for long internally at the tourist information and in Helsinki’s marketing through the MyHelsinki service. MyHelsinki.fi is a service which compiles the recommendations of locals to the benefit of visitors and locals alike. MyHelsinki gathers current information about the City’s locations, events and activities and aims to offer information that is of high-quality, up-to-date, comprehensive and curated. Indeed, this is reflected in the motto of MyHelsinki: Your local guide to Helsinki. Carried out in 2018 with financial support from the City of Helsinki Innovation Fund, the aim of the Plug in Helsinki project was to open this City data to new actors. 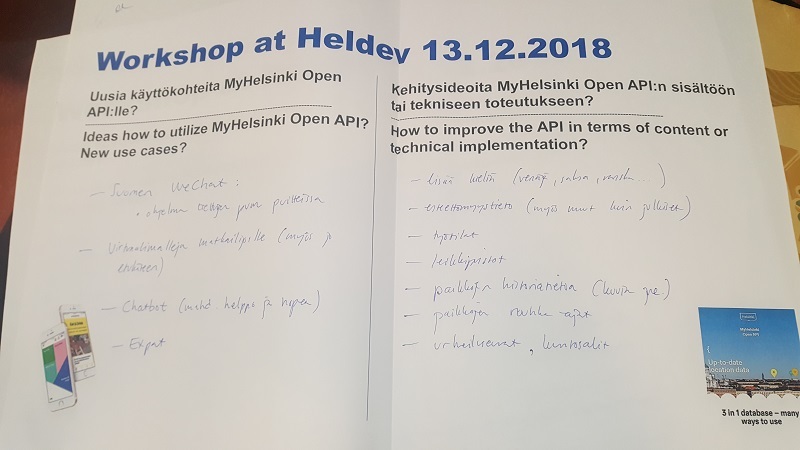 The MyHelsinki Open API, opened in November 2018, was realised as a part of the project. MyHelsinki Open API combines location, event and activity databases and offers the records in JSON format. Data can be searched using distance, category and language filters and the developer can search for specific attributes from the records. Through the API it is possible to search, for example, for address data, opening hours, contact information, descriptive texts and much more. MyHelsinki Open API can be browsed at open-api.myhelsinki.fi. The API has been developed in co-operation with Futurice and its requirements have been matched to the requirements of the service built with Tencent and the structure of Helsinki’s data. The final result is scalable and modular API, which meets the standards of an international major player and can thus function as a decent benchmark for domestic actors. The objective of MyHelsinki Open API is to enable new city development through innovative, commercial and non-commercial targets of application. The API’s source code will be opened in the near future, whereupon the API’s technical development can be carried out through new channels as well. WeChat is Chinese internet company Tencent’s social media application, which has more than a billion users. Tencent has developed a miniature application environment to its WeChat application, into which actors of different branches can bring services in the form of mini programs based on web technology. An advantage for the customer is that the mini program does not have to be downloaded separately and it does not require registration, as it opens directly to the WeChat environment and recognises the user. This lowers the threshold for the deployment of new services. Find the most current locations and events. 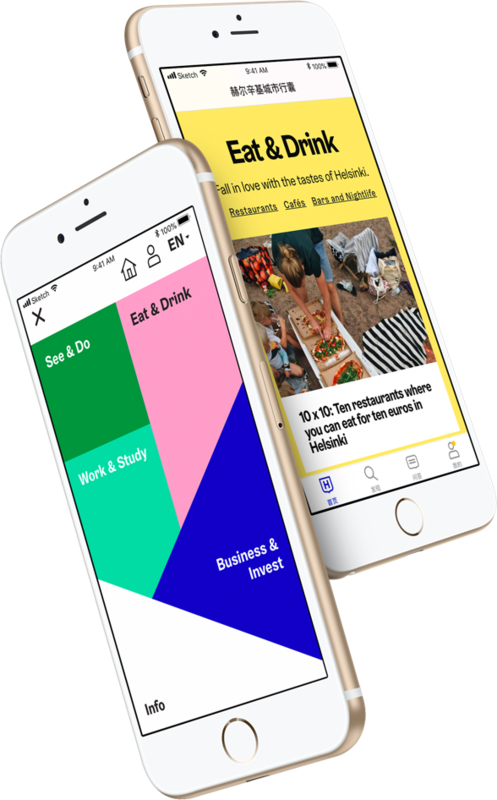 Easily get further information about things that interest you. Navigate fluently between different means of transportation with the Whim functionality. Pay with WeChat Pay during your trip. MyHelsinki mini program is thus the first city application which comprehensively offers the entire service path to the visitor. All the contents of the mini program come from Helsinki Marketing and Tencent is the first actor to use the MyHelsinki Open API. Through MyHelsinki Open API, Tencent maintains its dynamically updated material in the mini program, which ensures that the user always finds it interesting to return to the service. The MyHelsinki mini program has been crafted entirely in Chinese, in order to make it easy even for the inexperienced tourist to get to know Helsinki. Through the MyHelsinki Open API, the application also imports location and event data in article format for the tourist. The navigation feature has been constructed together with MaaS Global. MaaS Global’s Whim services integrated in the mini program allows for flexible use of different means of transportation in the City. Single and day tickets in the mini program, realised jointly with Helsinki Region Transport, are also part of the service. The navigation feature and the payment of fares are being introduced during January 2019. Before that, the tourist can already search for information through interesting contents. The first version of MyHelsinki Open API was finalised and published in November 2018. The API has been marketed to new actors and the aim is to get as many actors as possible to find new ways to use open data. What kinds of uses are there for MyHelsinki Open API, besides the current ones? 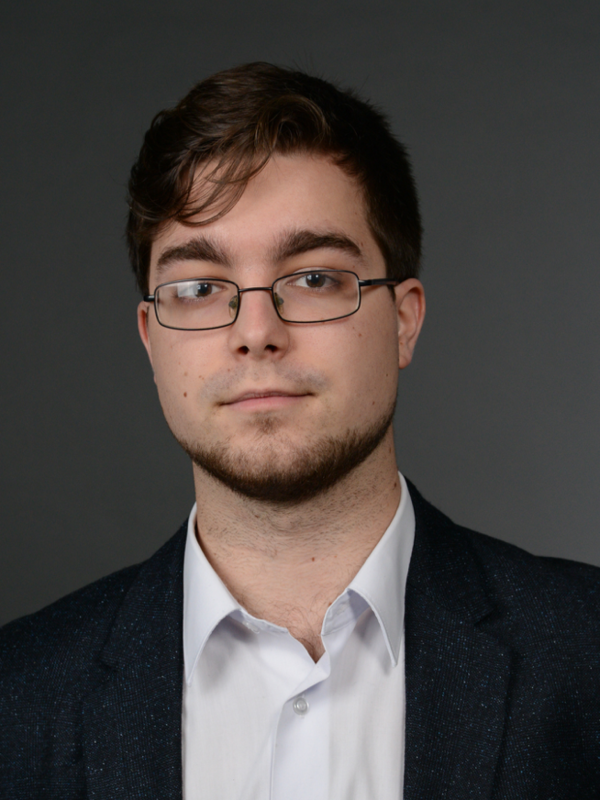 What kind of content-related or technical targets for development do you find in the API? The possible transferring of records that are being removed from the database to an archive database maintained by the museums. Combining the MyHelsinki Open API’s records with Helsinki’s historical imagery. A chatbot functionality to support the use. So for the API, 2019 starts with the exploration of new collaboration possibilities and with recognising and prioritising technical targets for development. When the first pilot projects have been established, the API’s source code will be opened to the public. Helsinki Marketing thanks all participants for the interesting conversations and wishes everyone an inspiring 2019.